The Benefits of Comforel � Fiber are not for just synthetic pillows. Down & Feather blend bedding is also benefiting from this fabulous fiber! 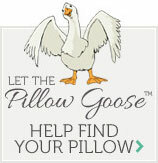 The Pillow Factory � has introduced their new line of Comforel � blend feather & down pillows to rave reviews. What makes the Pillow Factory � Comforel � pillow unique is the pillow in pillow design. An inner chamber of 95% feather & 5% down is wrapped around an outer chamber of Comforel � fiber. This gives the pillow unmatched soft comfort but feels like a supportive full fill feather pillow. If you love down & feather pillows but don't want to sacrifice support or you want to upgrade your existing comforel � pillows then the Pillow Factory � Comforel Down & Feather pillow is for you!